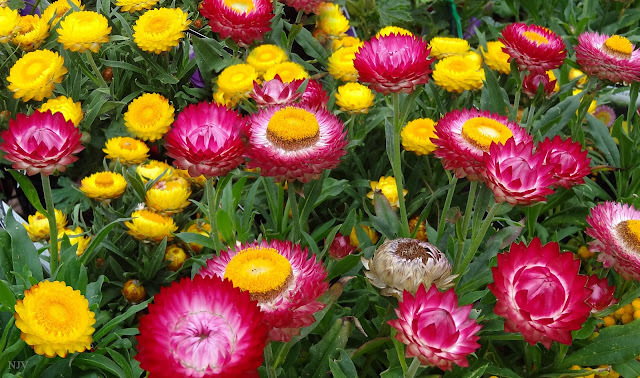 Xerochrysum bracteatum, commonly known as the golden everlasting or strawflower, is a flowering plant in the family Asteraceae native to Australia. Described by Étienne Pierre Ventenat in 1803, it was known as Helichrysum bracteatum for many years before being transferred to a new genus Xerochrysum in 1990. It grows as a woody or herbaceous perennial or annual shrub up to a metre tall with green or grey leafy foliage. Golden yellow or white flower heads are produced from spring to autumn; their distinctive feature is the papery bracts that resemble petals. The species is widespread, growing in a variety of habitats across the country, from rainforest margins to deserts and subalpine areas. The golden everlasting serves as food for various larvae of lepidopterans (butterflies and moths), and adult butterflies, hoverflies, native bees, small beetles, and grasshoppers visit the flower heads. The golden everlasting has proven very adaptable to cultivation. It was propagated and developed in Germany in the 1850s, and annual cultivars in a host of colour forms from white to bronze to purple flowers became available. Many of these are still sold in mixed seed packs. In Australia, many cultivars are perennial shrubs, which have become popular garden plants. Sturdier, long-stemmed forms are used commercially in the cut flower industry.